The subject of human suffering is a stumbling block to a great many people, tripping people up in their understanding of who God is. The oldest conundrum that people have mulled over for generations boils down to this one thing: If there is a God that is all powerful how can he allow suffering? Either he isn’t all powerful and can’t stop suffering, or he is all powerful and chooses not to stop suffering, and either way they don’t want to follow “that kind” of God. When tempted, no one should say, “God is tempting me.” For God cannot be tempted by evil, nor does he tempt anyone (James 1:13). And the Lord said to Satan, “Behold, all that [Job] has is in your power; only do not lay a hand on his person (Job 1:12). and as for the suffering of death and separation from our loved ones, Jesus came to overcome the sting of it, which is sin. Where, O death, is your victory? Where, O death, is your sting? The sting of death is sin, and the power of sin is the law. But thanks be to God! He gives us the victory through our Lord Jesus Christ (1 Corinthians 15:55-56). I don’t pretend to have all the answers because who can know God’s mind? Some of it we just won’t understand until we are past this world. For who knows a person’s thoughts except their own spirit within them? In the same way no one knows the thoughts of God except the Spirit of God (1 Corinthians 2). However, what we can do is look at what the Bible says about mourning, suffering and God’s comfort in our pain. The word “mourn” in Matthew 5 in Greek is πενθοῦντες or transliterated, “pentheó” (pronounced pen-theh’-o). Its meaning is “manifested grief so severe it takes possession of a person and cannot be hid” and was used when speaking of grieving a death, grieving a sin committed, or grieving the death of a personal aspiration. We know from the Bible that the Israelites had a formal mourning period of 30 days when someone died. As an outward sign of inner distress, they tore their clothes, put on sackcloth (coarse, black cloth made from goat’s hair), would not wear any jewelry or cosmetics. Women let their hair become unkempt and men shaved their head, as well as, covered their mustache and beard. If we are proud, God will work to break that in us so that we come to a place of mourning our sin. He can then take what is broken and put it back together in his way. When the Israelites would mourn their sin with a repentant heart, they would – in addition to all the mourning activities for a death – sit in ashes from a wood fire and put it on their head as a public sign of humility. Wash your hands, you sinners, and purify your hearts, you double-minded. Grieve, mourn and wail. Change your laughter to mourning and your joy to gloom. Humble yourselves before the Lord, and he will lift you up. 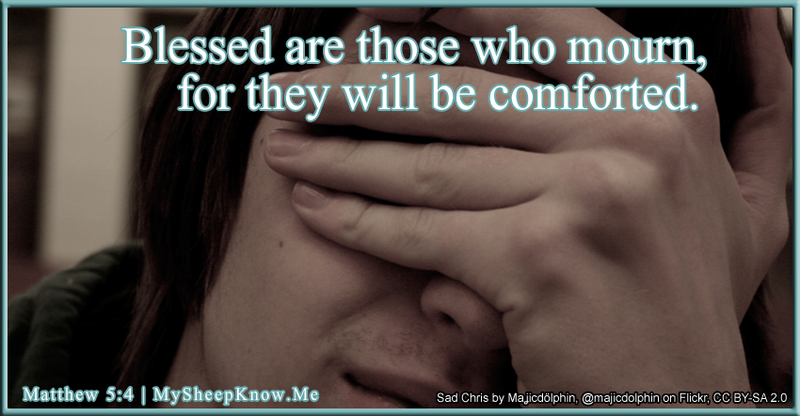 Blessed are you who weep now, for you will laugh (Luke 6:21). But if you will seek God earnestly and plead with the Almighty, if you are pure and upright, even now he will rouse himself on your behalf and restore you to your prosperous state. Your beginnings will seem humble, so prosperous will your future be… Surely God does not reject one who is blameless or strengthen the hands of evildoers. He will yet fill your mouth with laughter and your lips with shouts of joy (Job 8:5-7,20-21). God says it is good to mourn our sin and the sins of the world, to ponder our mortality, because one day we will die. It is better to be morose about it all than to be partying and laughing it up, without a single thought to our afterlife. One day, God promises us that he will create a new earth for us to play in, one without the pains of this world. It will be so wonderful that we will forget about this painful life that we have now. Surely we will be laughing together then! See, I will create new heavens and a new earth. The former things will not be remembered, nor will they come to mind. But be glad and rejoice forever in what I will create, for I will create Jerusalem to be a delight and its people a joy. I will rejoice over Jerusalem and take delight in my people; the sound of weeping and of crying will be heard in it no more (Isaiah 65:17-19).